What may be something of a surprise, radialene 1 has only just now been synthesized.1 What makes this especially intriguing is that radialene 2, radialene 3 and radialene 4 have been known for years. Paddon-Row, Sherburn, and coworkers speculated that radialene must undergo polymerization much more rapidly than the other radialenes. They computed the activation barrier for the Diels-Alder dimerization of the radialenes at G4(MP2). (The optimized structure of 1 and the transition state for the dimerization of 1 are shown in Figure 1.) The activation barrier for the dimerization of 1 is computed to be only 14.3 kJ mol-1, much lower than for the dimerization of 3 (59.2 kJ mol-1) or 4 (31.5 kJ mol-1). Figure 1. G4(MP2) optimized geometries of 1 and the TS for the dimerization of 1. Application of the distortion/interaction energy model helps to understand why 1 is the outlier among the radialenes. The distortion energy to bring two molecules of 1 to the transition state geometry is about 63 kJ mol-1, and this is much less than for radialene (102 kJ mol-1) or radialene (96 kJ mol-1). The reason lies in that radialene is close to planarity and so only the pyramidalization at one carbon is necessary to reach the TS geometry. For 4, which is in a chair geometry, significant distortion is needed to bring the double bonds into conjugation. For 3, the high distortion energy is due to the significant pyramidalization energy needed. Another interesting note is that the TSs for the Diels-Alder reactions of the radialenes is bis-pericyclic. The authors point out that dynamic effects may be important – though they did not perform any MD studies. These computations drove the synthesis of 1 by coordinating it to two equivalents of Fe(CO)3 and then driving off the metals with cerium ammonium nitrate in acetone at -78 °C. 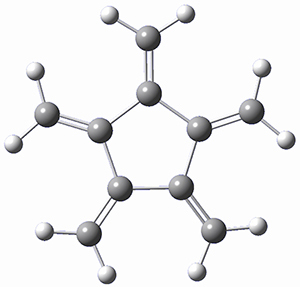 The free radialene was then detected by NMR, and it decomposes with a half-life of about 16 min at -20 °C. (1) Mackay, E. G.; Newton, C. G.; Toombs-Ruane, H.; Lindeboom, E. J.; Fallon, T.; Willis, A. C.; Paddon-Row, M. N.; Sherburn, M. S. "Radialene," J. Am. Chem. Soc. 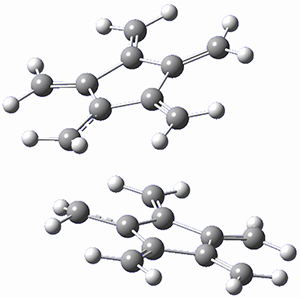 2015, 137, 14653–14659, DOI:10.1021/jacs.5b07445.